The Trainer Jockey Combo Stats report shows that David O'Meara and Daniel Tudhope have been in decent form together of late, having eight winners (20%) and 17 places (42.5%) from 40 runners for level stakes profits of 13.75 and 13.36 respectively. This has also produced an Impact Value of 2.0, meaning they are more than twice as likely as average to have had the winner. They team up with a few horses at Newcastle today, but it is Fayez that I am going to be taking a closer look at. Fayez has been running well over the summer with two wins and a second place from his last six races, including a win here last time over over a mile. This three-year-old has never raced over today's distance, however, he was staying on strongly when he won over nine furlongs at Newcastle, so I would expect him to get the trip without too many problems. He does have an extra five pounds to contend with today courtesy of that win last month, but he did win in good style so a repeat of that performance will hopefully see him go close. It is interesting to note from the Trainer Snippets that O'Meara has a good record with horses that move in distance from their previous race. 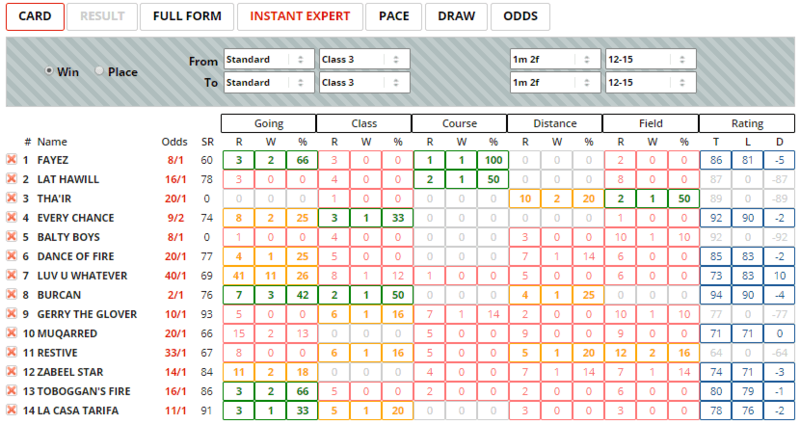 From 59 runners that fit this criteria he is showing a level stakes profit of 14.60 and an Impact Value of 1.61. Daniel Tudhope has been among the winners over the past month, winning 16/90 for a level stakes profit of of 5.48 and an Impact Value of 1.85. There are not too many green sections on the Instant Expert report but Fayez does have two, for the going and the course. Only one other runner also has two sections of green, so not many of them appear particularly well suited to today's conditions. We can see that prominent runners have the best record here over this distance, with 13.41% of them winning the race for a small level stakes profit. Next best are horses that are held up and Fayez is a definite hold up horse. Both of his recent victories have been when he has been held up and waited with, and I expect Tudhope to try the same tactic again here today. 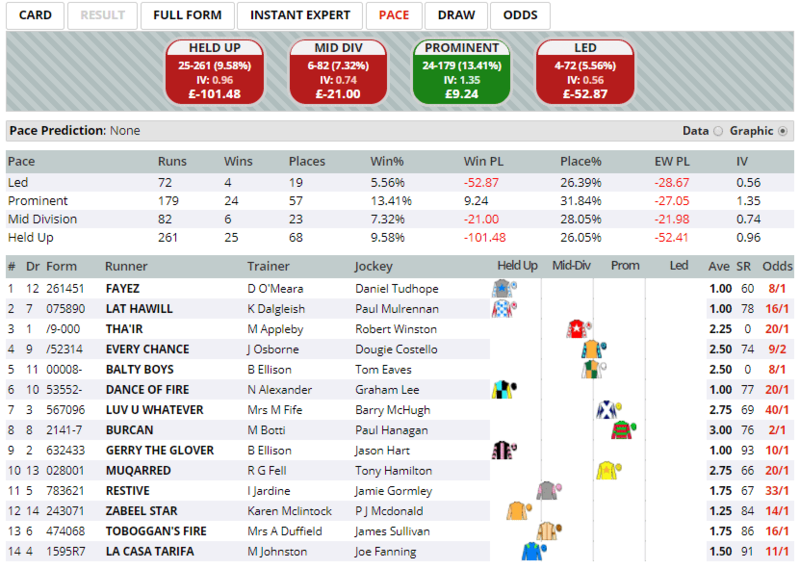 Click here for the 14:10 at Newcastle.